Can Essential Oils Help Manage Skin Issues in Dogs? Herbal and other alternative treatments, including essential oils, have become more popular as pet parents search for natural remedies for their dogs’ skin issues. Tea tree oil and specially formulated essential oil blends have been used by veterinarians and dog owners to treat “hot spots” (aka acute moist dermatitis), allergies, external parasites, and yeast and bacterial overgrowth on skin. While essential oils have potential health benefits, there’s much more that needs to be learned about using them appropriately and safely in pets. Essential oils are compounds extracted from plants that give the plant its scent and flavor. According to Richard Palmquist, DVM, chief of integrative health services at Centinela Animal Hospital in Inglewood, California, plants make these oils to help defend against insects, bacteria, fungi and viruses. The chemicals in essential oils are powerful; only very small amounts are needed to affect most body systems. 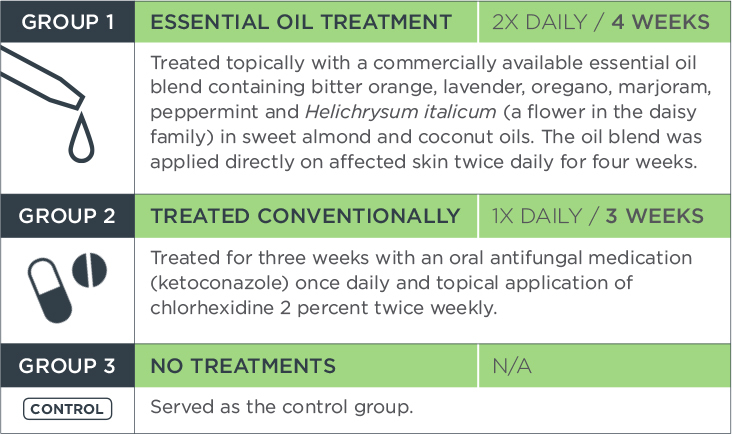 What holistic veterinarians particularly like about essential oils for topical use is their antifungal (anti-yeast) and antibacterial properties. When used appropriately, essentials oils play a key role in integrative veterinary care. It’s important to note that essential oils CAN have undesirable and even dangerous side effects. Dogs respond to and break down essential oils differently than people do, so it’s important to talk with your veterinarian before using them on your pet. Some dog owners and veterinary professionals are skeptical about the effectiveness of essential oils for skin problems. However, a growing body of research shows they can help manage specific skin conditions. Follow-up visits were performed 30 and 180 days (one and six months) after treatment began. At the 30-day exam, dogs in both treatment groups were significantly improved and the differences between the two treatments were not statistically significant. By the 180-day follow-up visit, however, all of the dogs receiving the three-week conventional treatment had experienced a recurrence in their Malassezia dermatitis symptoms. No significant changes were noted in dogs that received the essential oil blend. It’s important to realize that the dogs in this study had a very specific type of yeast infection and were treated with a particular essential oil product. Essential oils may not be appropriate therapy for other itchy skin conditions, and other oil blends may provide different results. Since many conditions can cause scratching and itching in dogs and their treatments can vary, it’s important to consult your veterinarian and have your dog’s skin problems properly diagnosed. While people may be able to tolerate 100 percent essential oils, that’s not necessarily true for our pets. The essential oils used in pet care products are generally intended for use only after tremendous dilution. In fact, veterinary toxicologists with Pet Poison Helpline warn pet parents never to apply 100 percent essential oils to their pets. Before using any essential oil product on your dog, be sure to talk to your veterinarian. Nardoni S, Mugnaini L, Pistelli L, et al. Clinical and mycological evaluation of an herbal antifungal formulation in canine Malassezia J Mycol Med. 2014;24(3):234-240.